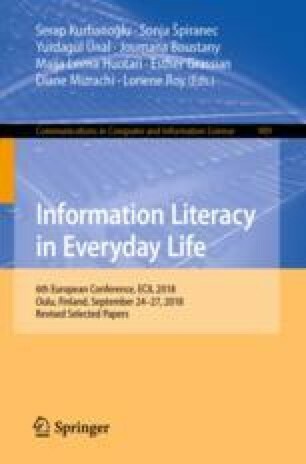 To address the research gap on age-based differences in health information literacy (HIL), we investigated how younger (born 1960–) and older adults (1946–1960), and elderly citizens (–1945) differed from each other by their HIL competencies. Data were collected with an online survey of patients using the Swedish national electronic health record system. Altogether, 2,587 users responded. One-way ANOVA with post hoc tests revealed several differences between the groups: younger adults were less likely to value health information than older adults; older adults and elderly were least likely to compare information from multiple sources and had trouble in determining health information needs; older adults were most likely to have trouble understanding health terminology and the elderly to have difficulties in understanding medicinal package labels. The study shows that HIL is not necessarily improving or declining but adapting to challenges of advanced age. The data collection was a part of the work of the Swedish DOME research consortium (projectdome.wordpress.com). This study was conducted in collaboration between DOME consortium and the Academy of Finland funded research project Taking Health Information Behaviour into Account (HIBA).